Gregor the Overlander When eleven-year-old Gregor falls through a grate in the laundry room of his apartment building, he hurtles into the dark Underland, where spiders, rats and giant cockroaches coexist uneasily with humans. This world is on the brink of war, and Gregor's arrival is no accident. Gregor has a vital role to play in the Underlan's uncertain future. Gregor wants no part of it - until he realizes it's the only way to solve the mystery of his father's disappearance. Reluctantly, Gregor embarks on a dangerous adventure that will change both him and the Underland for ever Gregor and the Prophecy of Bane Spies have reported the sighting of a Rat King in the Underland, a character who has been legendary since the Middle Ages. Recognizable by its tremendous size and snow-white coat, the Rat King is destined to bring a World War to the Underland. Gregor eventualy comes face to face with the Rat King, and to his surprise, he finds he is unable to kill this creature. Gregor's heart tells him he's making the right decision. Will it be a decision he liveso regret? Gregor and the Curse of the Warmbloods Gregor and Boots must return to the Underland to help ward off a plague. It is spreading fast, and when it claims one of Gregor's family, he begins to truly understand his role in the Prophecy of Blood. Gregor must summon all his power to end the biological wrfare that threatens the fate of every warmblooded creature. Gregor and the Marks of Secret It's only a few months since Gregor and Boots returned from the Underland, leaving their mother behind to heal from the plague. 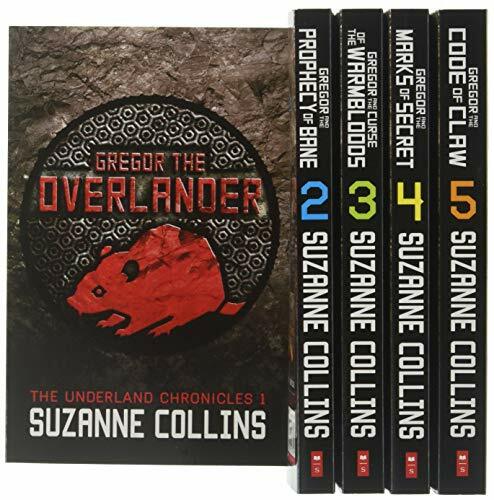 Though Gregor's family receives frequent updates on her condition, they all know Gregor must return to fulfill his role as the warrior who is key to the Underlanders' survival.